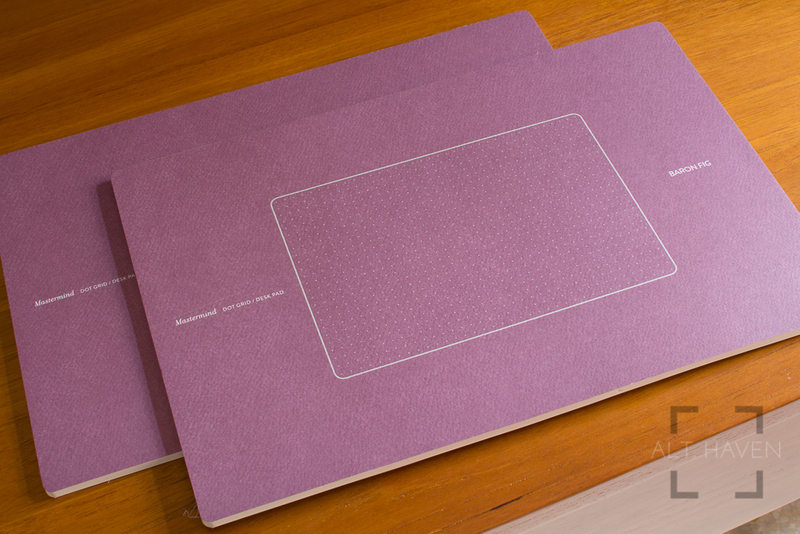 My thanks to Baron Fig for sending me the Mastermind for review. Here I am back again with yet another Baron Fig product review. This time I am reviewing the Mastermind. The Mastermind is basically a desk pad. I remember my father having a desk calendar which he used to dot down notes and events as the month passed. The Mastermind functions similarly but without the constrains of an actual monthly calendar format. The Mastermind comes in only one size. It measures 12" X 8" (30.48cm by 20.32cm), that’s slightly longer than the length of my Apple Wireless Keyboard. USD$15 gets you 2 pads of 35 sheets each. They only come in the dot grid format. Personally the Mastermind desk pad took me by complete surprise. I didn’t expect to have much use for it since my table at home and the office are littered with notebooks, Post-Its and scrap paper. I have no want of more paper, or so I thought. However, just by the virtual of having the desk pad right in front of your keyboard or underneath it as the case maybe, it changes everything. I take notes faster, I don’t have to keep track of my fluttering Post-Its or random pieces of paper. Anything that I needed to know is all written down right in front of paper. I don’t have to flip my notebook to an empty page thinking if this information should be here or there. The Mastermind gives me the freedom be productive without the constrains, it allows me to doodle if I’m bored, remind myself with my to-do list written right in front of me. Personally I found the Mastermind works best with I am in the office. My desk there is larger and it can accommodate the Mastermind and a full keyboard without problems. At work I am expected to keep track of the hours I spend working on each individual project for billing purposes. I note down the relevant information as the day goes by. I run through my Mastermind at about 1 sheet per week becasue I use both sides of the paper. At home, I have my Mastermind sitting under my keyboard. However this setup only allows half the Mastermind to be visible but due to space constrains that’s the way it has got to be. However, the other half of the paper isn’t wasted, I fill up half the page then I rotate it 180 degrees and I get a fresh space to write on. I notice that the pad at home is more prone to get dog-eared quickly but that’s probably due to the shifting of the desk pad on and off the desk whenever I need more space. The paper is the same found in Baron Fig’s notebooks - Vanguard and Confidant. And it performs admirably as the paper found in them. There is no bleed through that I’ve encountered with my pen and ink combination and this allows me to use both sides of the paper. However, note that the dot grid pattern is only printed on one side of the paper. The dot grid is the same size on the Mastermind as they are in the notebooks. The Mastermind is one product that I heartily recommend. It isn’t so large that it is hard to find space for on a regular desk and it is format to constrain you to date boxes or lines. Use it to doodle or jot down important information and everything else in between and the best thing? It is all fountain pen friendly paper.